In 1963, with the undercurrent of the Civil Rights Movement, one in five Americans was living in poverty. Although the previous decade brought general economic prosperity, the rising tide was not lifting all boats. Americans were suffering from unemployment, lack of education,and malnourishment. In response, on January 8, 1964, in his State of the Union address, President Lyndon B. Johnson declared an “unconditional war on poverty.” Inspired by President Roosevelt’s New Deal and President Kennedy’s promise to help the impoverished, President Johnson proposed bold new legislation to address the economic conditions that caused poverty. He sought to provide opportunities to every American no matter race nor income, calling for not only social justice but economic justice. This was President Johnson’s vision of the Great Society. 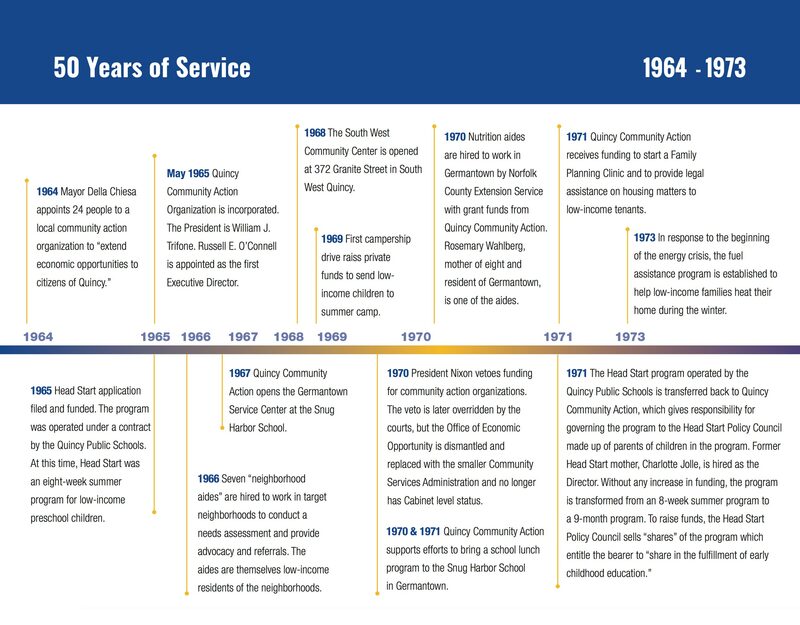 In 1964, Quincy Mayor Della Chiesa appointed 24 residents to form the Quincy Community Action Organization (QCAO) to “extend economic opportunities to the citizens of Quincy.” In March 1965, the Board of Directors held the first meeting of the organization and in May, QCAO was officially incorporated. Its first President was William J. Trifone, and first Executive Director was Russell O’Connell. Shortly after his tenure, Rosemary Wahlberg was appointed as the agency’s Executive Director, growing QCAP into a leading, well-respected non-profit with a budget of $17 million. She understood from her own personal experience the needs of low-income, working mothers and how to help them become financially stable. 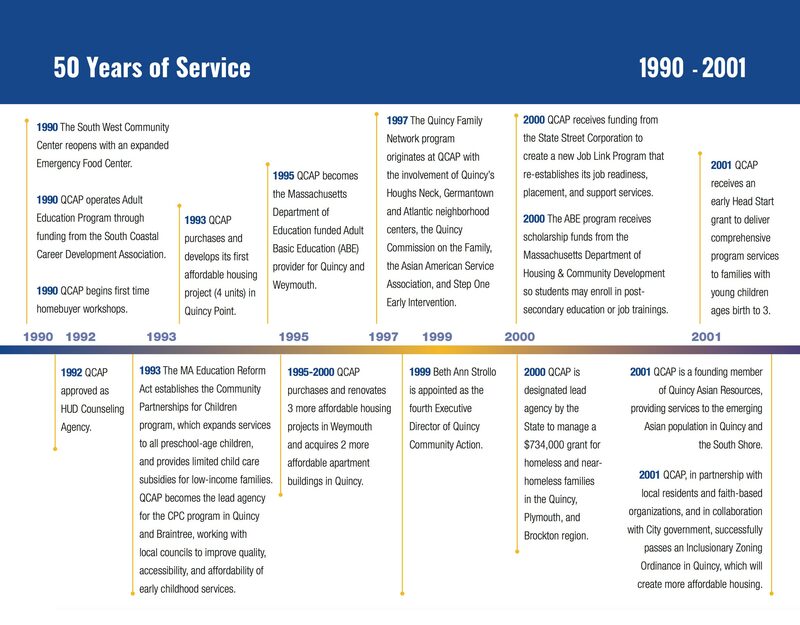 Since 1965, Quincy Community Action has been the leading anti-poverty service provider in the Greater Quincy region. 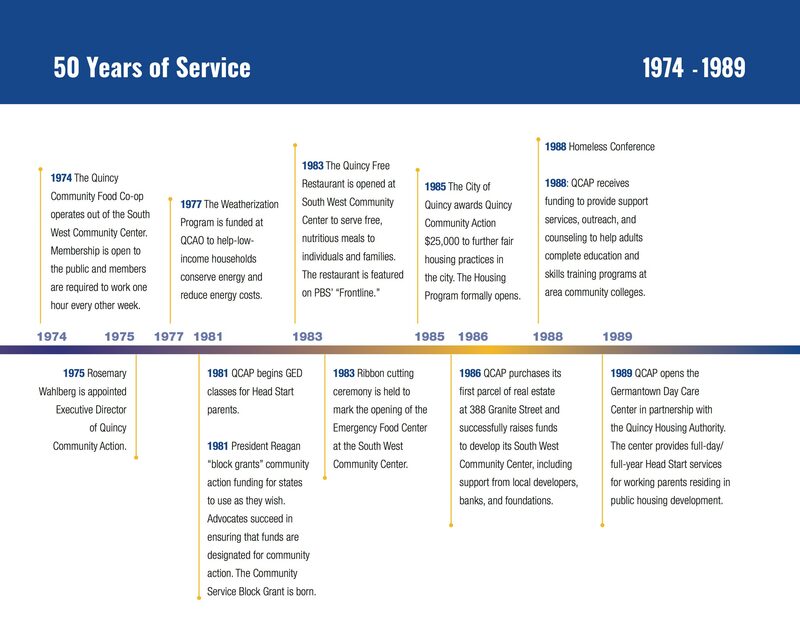 From our humble roots, we continue to work side-by-side with residents, leaders, and partners to ensure that the needs of our community and its families are met. This includes basic needs such as food and nutrition, fuel assistance, affordable housing, quality early education and care, adult education and workforce development, and financial education. 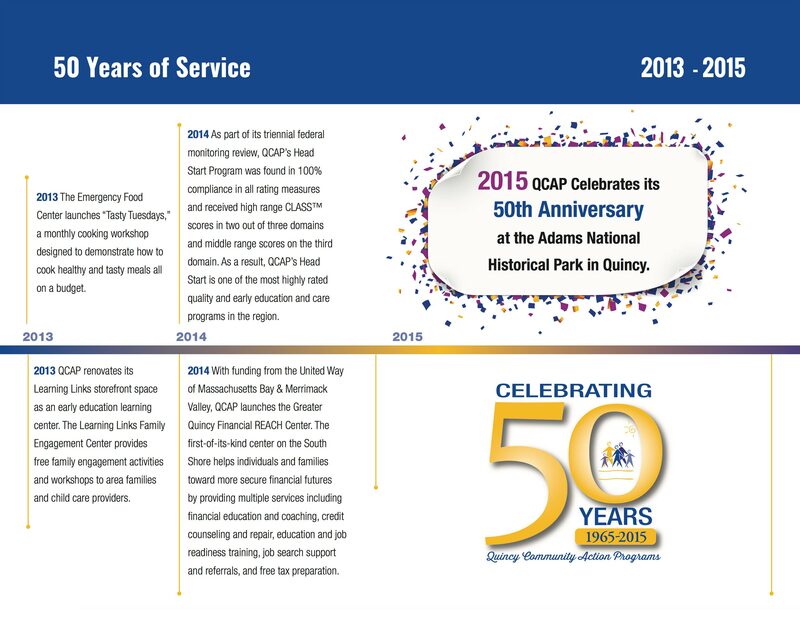 Today, Quincy Community Action Programs (QCAP) has expanded its programs to reach a service area consisting of more than 80 communities. 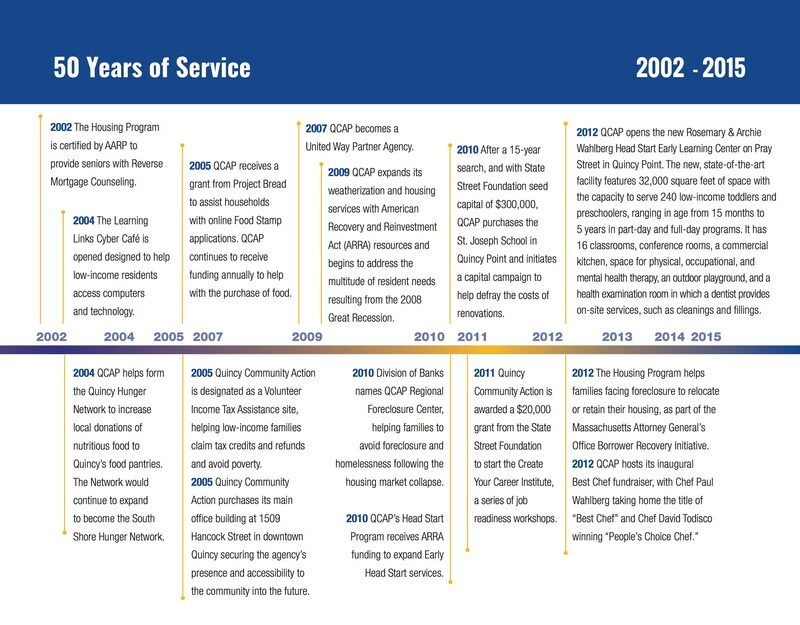 Annually, more than 21,000 unduplicated people benefit from QCAP services.